From the output, we learn that the IP address of the neighbor router is 10.1.1.2 and the question stated that the subnet mask of the network between two routers is 255.255.255.252. Therefore there are only 2 available hosts in this network (22 – 2 = 2). So we can deduce the ip address (of the serial interface) of Manchester router is 10.1.1.1. The platform of the neighbor router is cisco 2610, as shown in the output. 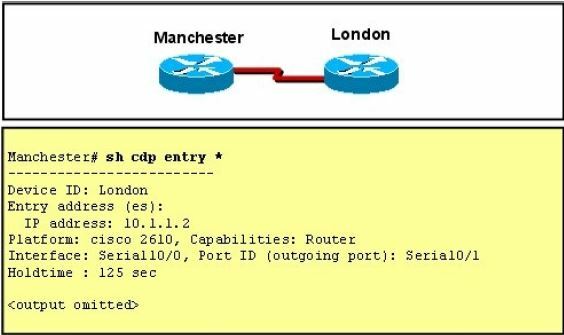 Maybe the most difficult choice of this question is the answer E or F. Please notice that “Interface” refers to the local port on the local router, in this case it is the port of Manchester router, and “Port ID (outgoing port)” refers to the port on the neighbor router.